On the Thursday before our Thanksgiving Holidays, Vanessa Tindall's Cosmo 2 Senior Girls took their nail salon on the road to Walker County's Senior Gals. Fonda Franklin shows of her nails with her Nail Technician, Raquel. Working with Kasie Kroll and Frank Ivory of the Senior Center of Walker County, most of Mrs. Tindall's class were able to set up a pop up nail salon in a room adjacent to the daily bingo game and offered free manicures to anyone who wanted one! Maria is concentrating on the Client. These are all second year students, and well on their way to earning the one thousand hours that they need to complete before testing. After a written test, the practical test measures the students ability to manicure, perform a facial, apply color and relaxer, cut hair, roll a perm (apply solution and perform a test curl), blow dry, properly manipulate a curling iron and handle all manner of sanitation and safety surrounding the salon services. Opal Sanford is pretty impressed! Once they pass their certification test, they are licensed cosmetologists and can work anywhere in the state of Texas. This means that these students can earn money to become financially independent, whether they plan on attending college or not. 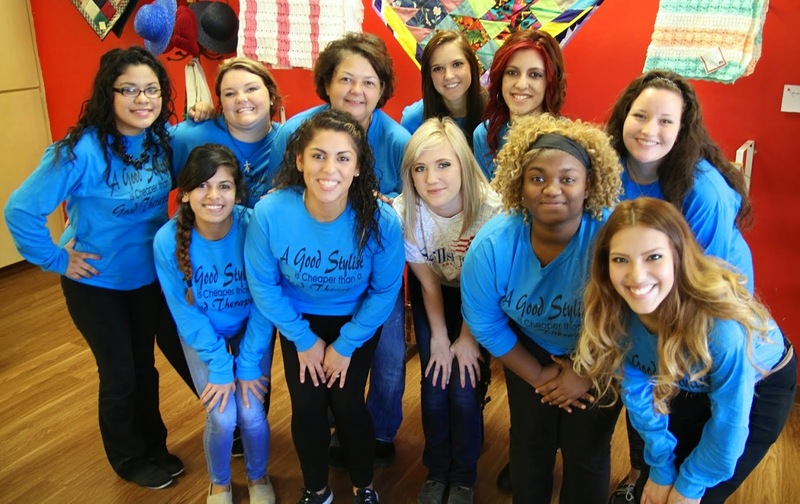 These Cosmo 2 students are future entrepreneurs and independent business women. Last May, every Cosmo 2 student that took the test passed- 100%! So it's truly a win win situation for the Huntsville Senior Girls and the Walker County Senior Gals. Kee'Kee takes a quick smile break! Vanessa works on client Norma's hand. and Site Manager Kasie Kroll. Velma Johnson admires her nails. Angel & Katie. Not only did they bring the salon, they brought the smiles, too! Velma Johnson is ready for some nail love! The Wisdom of T-Shirts: "A Good Stylist is Cheaper Than a Good Therapist"
Bryanne displays her Cosmo 2 shirt. Mrs. Tindall was the one woman support team, and kept the warm water coming. Let the record show that guys were invited to participate, including these gentlemen here. No doubt they would have taken the ladies up on their offer but they had some domino playing to do! and T.J. Clopton (green jacket) and Harold Park (in hat). The Senior Center offers beautiful, handmade crocheted, knitted and quilted items at more than fair price. Here Cosmo 2 student Raquel models a knitted shawl that she could not leave (or live!) without! A few minutes later, Raquel meets Adele Debler, a nail client and the creator of that very wrap she purchased. Chelsea says: That's not just my client, that's my Grandma! The Senior Center of Walker County is located 340 SH 75, Huntsville, Texas 77320. Is Vanessa wearing her heart on her sleeve? There were some stories told! Let's just say that what is said in the nail salon stays in the nail salon! Cosmo 2 at the Walker County Senior Center- Roll Call! because their schedules did not allow them to make the trip. The utilization of different nails workmanship embellishments like rhinestones, acrylic stones, 3D nail stickers, fired blooms, fimo craftsmanship pieces, pounded shells, and so on to give some examples are additionally being broadly used to feature the nails and give them a progressively refined look. If the Holidays Aren't Here, They Sure are Close!